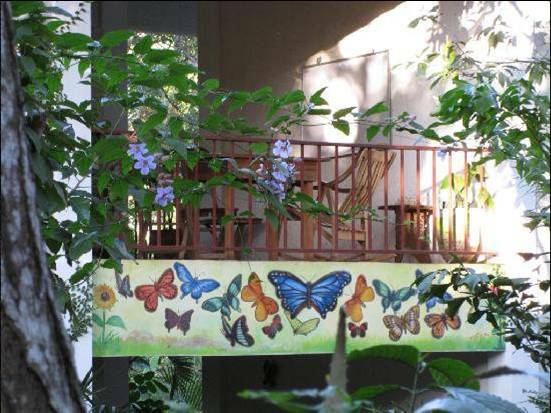 Situated in a green, hilly region of the White Villages, close to the lakes, volcanoes, the Pacific coast and colonial cities of Nicaragua, the Mariposa (butterfly) Spanish School and Eco-Hotel is a unique place. We combine a professional Spanish school with an eco-hotel which attempts to integrate care for all aspects of our environment and community. The Spanish classes are at all levels (beginner to advanced), the classes are one teacher for each student, and our teachers are well trained. For more information on the school please visit the website. The classrooms are set in our lovely, tranquil grounds or on one of our terraces (see photo below). With the income from the school we support a wide range of eco initiatives and community based projects. Our philosophy is to be as integrated as possible with both the local community and our environment. Everything is important - from the trees and gardens planted around the Mariposa building to minimizing the impact each individual action has on the planet as a whole. The school/hotel building, constructed in 2005, was built using the most sustainable materials available and we have recently experimented with building our cabin (top image) in volcanic rock and caña (a type of locally available bamboo). The veranda railings are made from prunings from our coffee trees and the roof is thatch. Furnishings throughout the school and hotel are all made locally, using sustainable materials such as banana fiber. Electric power is solar generated and hot water for showers is also solar heated. We have a small organic farm producing much of the fruit (including bananas, papayas, and oranges) and vegetables (especially eggplant, salad leaves, carrots, beets, beans, corn) consumed in the hotel, as well as our own free range eggs. A future plan is to use our farm as an experimental model and training centre to encourage interested local people to try this method. We have a worm project which provides excellent natural compost, using just ox and horse manure! We also produce our own organic coffee. The Mariposa is set in two acres of land - we have planted over 200 native but threatened hardwood trees (including guanacaste, cedro, acetuna - all of which have been massively cut in this area) and undertaken a number of projects to encourage wildlife. Butterflies, birds, lizards, bats, - are all thriving. The Nicaraguan national bird, the guardabarranco, nests here. A particular success has been the frog pond which now hosts 3 different varieties of frog, including the spectacular tree frog. The pond also attracts dragon flies and number of insect eating birds. Our grounds are also home to a number of plants which have medicinal uses as well as the nime tree - the leaves of which produce an excellent natural pesticide. Local people have a great deal of knowledge in this area which we at the Mariposa are fostering and validating - especially as a way to try and lessen our dependence on commercial drugs. We also have a small animal rescue project. A number of parrots and 4 monkeys now live with us - confiscated by the police from the illegal trade in wild animals, they were hand fed and are now too tame to be set free. We have built them large comfortable cages. 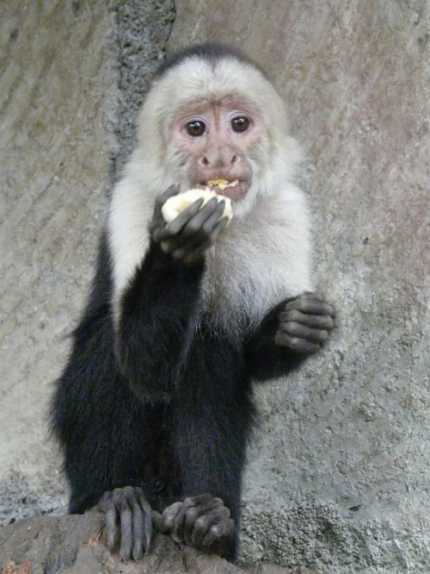 Many other rescued animals (from rabbits to anteaters) have been released into the wild, either here or at El Chocoyero Nature Reserve. We also care for 12 rescued horses, 7 dogs and 5 cats. An important part of our work is education leading to action. An example is water. We found out where our water comes from - it is aquifer fed and, as all over the world, this is threatened by pollution and overuse. So we have installed a basic grey water recycling system, a rainwater collection tank and a latrine to reduce our demand on the aquifer. We also know that the consumption of meat is very costly to the planet - so we serve mainly vegetables, legumes etc and make sure they are locally grown to avoid transporting food large distances. Rubbish is another major issue. We start by generating as little as possible and asking both staff and guests to be careful about the number of snack wrappers, plastic bottles etc thrown away. Nicaraguans are, on the whole, very good at re-using discarded things so we follow their example. Our input into the local community of San Juan de la Concha is also multi-layered. We maintain two school support and out-of-school projects (we pay a teacher to give extra help to children who need it), part fund a day care project, run a sports project and helped to set up a community garden project. The photos below shows residents of La Concha building vegetable gardens in their backyard, using a form of living fencing to keep out the pigs and chickens - the fence is built from a local plant called espadilla which was bought and transported by the Mariposa. 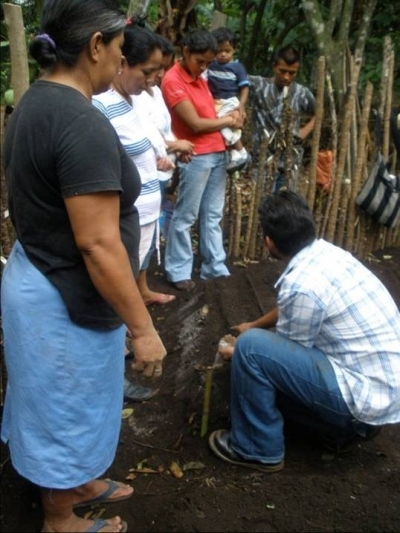 We then funded local people knowledgeable in organic methods to show the recipients how to plant and care for it. We also bring in other types of material donations - school stuff especially children´s story books, sports equipment.